This week my past and present intersected. This was surprising considering that I moved "1200 some miles" from where I grew up. I began working at UTSA in 2004, and the Men's Basketball team made it to the NCAA tournament that year. (I had applied for the job at UTSA at the end of February and cheered for the Roadrunners that March. Shortly after that, I was invited to come to San Antonio for a job interview.) After a few appearances in the tournament, UTSA did not have a win. This year they upset the #1 team in the Southland Conference to win the conference tournament. They were on their way to play in the "First Four" of the NCAA tournament in Dayton, Ohio. The University of Dayton has hosted the 64 vs. 65 game for a while now, but this was the first year for the "First Four," and a chance for the Roadrunners to win their first game in the NCAA Tournament. The University of Dayton and people in the area are great hosts for these early games. My mother-in-law bought tickets to the "First Four" games well before the games were announced. I attended various UD Men's Basketball games over the years at UD Arena and had two of my graduations there. I graduated from high school at UD Arena. (I had to consult my high school scrapbook to verify the location. I must be getting old! How did I forget that?) Seven years later, I graduated at UD Arena again with my master's degree. On Wednesday, I was happy to watch UTSA win there first even NCAA tournament game in my hometown. Their prize for winning a game was to go to Cleveland, Ohio to face the number one overall seated team in the tournament, The Ohio State Buckeyes. I was set to attend Ohio State until I visited Case Western Reserve University in Cleveland during April of my senior year. I remember calling my dad from a pay phone to explain that I had changed my mind and wanted to attend Case. I spent the next four years in Cleveland, and saw a couple of concerts (Dave Matthews Band and Bare Naked Ladies) at Gund Arena, now The Q where the next round of tournament games would be held. A #16 seat has never beat a #1 seat in the tournament (I learn these things from my dad.) 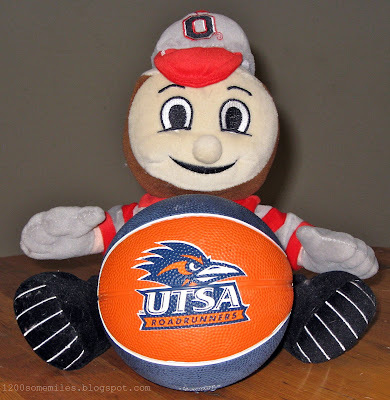 The Roadrunners were not able to change that on Friday, but I am still proud of the UTSA Men's Basketball team. For the photo, I just pulled a couple of items from Alex's toys. 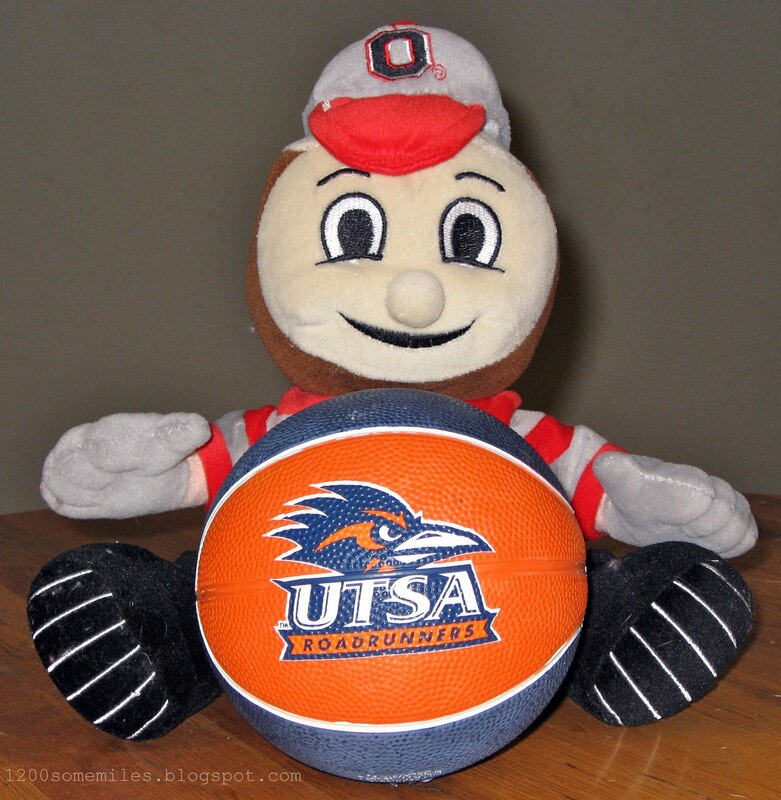 My parents got him the UTSA Basketball and my brother sent him the Brutus Buckeye.